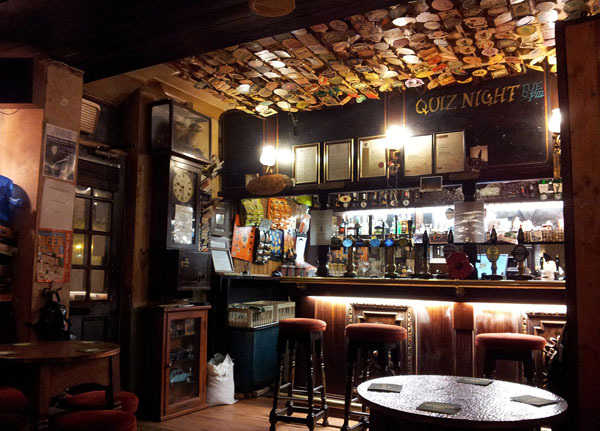 I went to Ye Olde Vic in Stockport for the first time last night as my local CAMRA branch was presenting it with a Pub of the Month award. I can't remember the last pub I went to in Stockport for the first time: it was probably when the Hope Inn reopened as a brewpub a few years back. 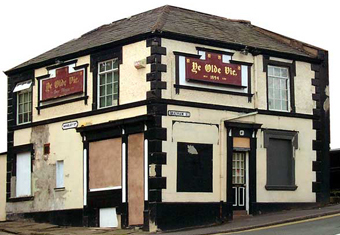 I'd heard about Ye Olde Vic's reputation for beer - it was one of the first multi-beer freehouses in Stockport, preceding the Crown and Magnet by a couple of decades - and unique atmosphere but, like many others it seems, assumed it was derelict on the numerous times I walked out of the back of the station or went past it when I worked in Stockport ten years ago, not unreasonably given the decidedly distressed exterior (for some time, I thought that when people talked about the semi-derelict pub behind the station, they were referring to the former Holt's house The Blue Bell just round the corner which definitely was shut and has now been converted into flats). I had American Pale Ale, the latest in the White Label series of beers from Stockport brewery Robinson's, for the first time yesterday. I didn't get round to trying the first beer in the series, an IPA, but I drank the second, a stout, a few times and enjoyed it, as I did this one: it reminded me a bit of last year's seasonal South Island, with a very clean taste and floral smack of New World hops, albeit Cascade, Amarillo and Columbus from the U.S. rather than Nelson Sauvin from New Zealand. I was thinking about the reasoning behind Robinson's White Label series. With the minimalist, faux-homemade pump-clips, they're clearly aiming for those who, unlike me, think of themselves as craft beer drinkers, probably wouldn't order a beer from the brewery's mainstream range and perhaps don't even realise that it's one of theirs. 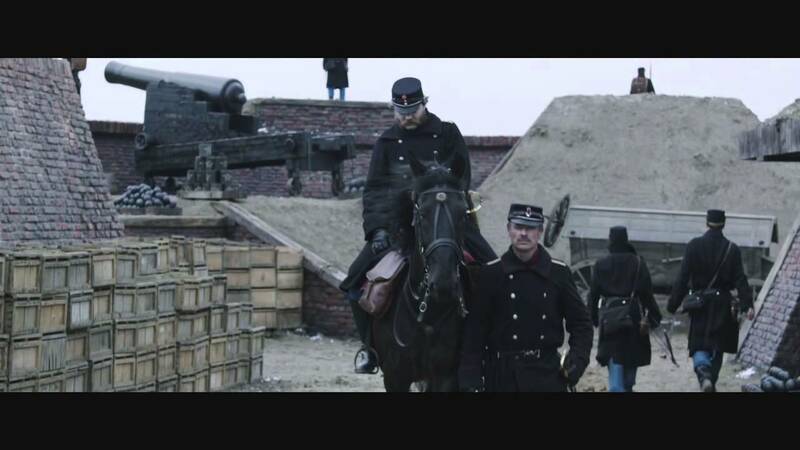 I'm enjoying BBC4's new series 1864 about the Second Schleswig War between Denmark and Prussia and Austria. I've watched and enjoyed pretty much all the programmes in BBC4's Saturday night Scandinavian drama slot - Borgen, The Bridge, The Killing, Wallander - and unsurprisingly there are one or two familiar faces from them here. The Second Schleswig War is an all but unknown, European war of the mid-nineteenth century, largely forgotten in the century-long gap between the end of the Napoleonic Wars and the outbreak of the First World War. I only knew about it because I'd read The Riddle of the Sands by Erskine Childers in which the two main characters sail their boat to the German war memorial, since blown up, at Dybbol. Looking at a modern map, you can see which bits of the nineteenth century war zone are now in Denmark and which are still in Germany (although Prussia and Austria won the war, under the Versailles Treaty Northern Schlewsig was returned to Denmark after a plebiscite there in 1920). The key battlefield at Dybbol is north of the German-Danish border again but the ancient defensive barrier the Danevirke, abandoned by the Danes in their retreat, is now a long way south of it. I wasn't sure at first about the use of flashbacks from the present in the programme but they've grown on me, as has the personal backstory of those in them, and I'm looking forward to the final episodes of the series next weekend.